WASHINGTON (CNN) -- College football's perennial armchair-quarterback argument over the need for a clear-cut national champion came to Capitol Hill Friday. 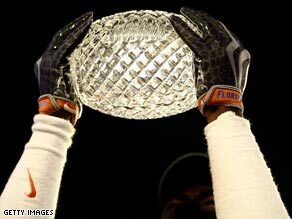 College football teams play in the BCS for the national championship trophy. The House Subcommittee on Commerce, Trade, and Consumer Protection held a hearing to dissect the Bowl Championship Series, asking whether the model needs to be tweaked, overhauled or done away with altogether. Four witnesses testified at the morning hearing, including championship series coordinator John Swofford and Alamo Bowl President Derrick Fox; both of whom defended the current system, though Fox conceded that "no system is perfect and the Bowl Championship Series is not perfect." Mountain West Conference Commissioner Craig Thompson and Boise State Athletic Director Gene Bleymaier testified that they would like to see the system revamped. Many critics say they want college football to have a playoff system to ensure that a champion is clearly defined. Rep. Joe Barton, R-Texas, called the Bowl Championship Series format unfair and perhaps took it one step further. "You should either change your name to BES for Bowl Exhibition System or just drop the C and call it the BS system, because it is not about determining the championship on the field." Both sides were cordial but opinionated. Fox said he would prefer Washington not get involved. "Those who don't like the current system will say that's the way of the world, but we don't believe that government should have any role in promoting a demise of the bowl games." Currently, 11 college conferences and three independents compete in the NCAA Football Bowl Subdivision -- formerly Division I-A. Six of those 11 conferences are guaranteed spots in the four Bowl Championship Series games. Schools from conferences that critics say are unfairly deemed as low profile are then left to fight their way into those prestige games. They share in significantly less of the series money and have less of an opportunity to challenge for the national title. President Obama is one of the proponents of a college football playoff. In an interview with ESPN in November, Obama said he's had just about enough of the Bowl Championship Series. "I'm fed up with these computer rankings and this, that and the other. Get eight teams -- the top eight teams right at the end. You got a playoff. Decide on a national champion," Obama said. Before heading out early to catch a flight, Barton made it clear that he expects to see college football change its ways or risk having lawmakers introduce legislation to impose change for them. "I think there is better than a 50 percent chance that if we don't see some action in the next two months on a voluntary switch to a playoff system that you will see this bill move," he said.